You need to go into 2019 knowing how much money you need to make. I’m not talking about writing “I will hit six figures” on your whiteboard 10 times every morning. I’m talking about a realistic and honest revenue number that will allow you to cover your costs (including your taxes) and live a nice life without constantly stressing about money. There’s a good chance that you are scared of the financial side of your business and really can’t stomach using spreadsheets for anything. If you’re honest, you would rather just wing it next year instead of setting a specific revenue goal. As I small business owner myself, I get that. I really do. The problem is, if you don’t know how much money you really need, you’re taking a risk that one of two things will happen. You won’t make enough money. We all know how easy it is to undervalue our services because of our own emotional struggles and insecurity. If you don’t know how much money you need to make, you are even more susceptible to chronic underpricing of your services. You won’t feel like you’ve made enough money. If you don’t know how much money you actually need, you may always feel like more is better, even if your needs have been met. Thankfully, you can set a revenue goal that is fully grounded in reality without complicated spreadsheets or an advanced degree in accounting. 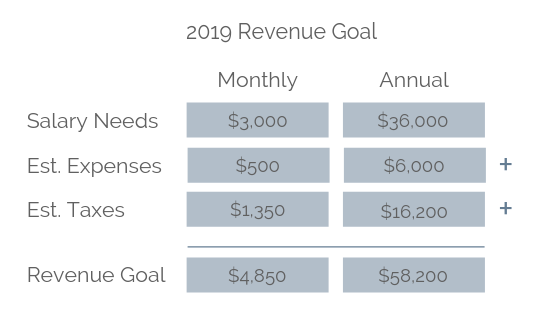 The following four steps walk you through a simple method to set your 2019 revenue goal. Disclaimer: This method assumes a service-based business that is an LLC or sole proprietorship. If your primary business is selling products, this won’t work for you. If you are a service provider that ALSO sells products (like an interior designer, or a photographer that has a print shop), this can still be a good starting point. Click here to learn more about how I help clients with goal-setting and financial planning. The first question is simple mathematically but sneakily complicated emotionally: How much do you need to pay yourself every month? The answer to this question is based on your personal needs and lifestyle as well as where you are in your business’s life cycle. If you are still in your first or second year, you may still be growing into a monthly salary that meets your needs. That’s ok! If you are farther along, you may feel like you need a raise this year. That’s ok too! There isn’t really a wrong answer, as long as you have a reasonable path to get to that number. In my example, I want to pay myself a salary of $3,000 per month. Look up what you spent last year. (If you don’t have a year’s worth of information handy, just look at the last three months.) Make note of the average monthly amount of each expense or category of expenses. Account for increases. It’s possible that your spending will stay pretty steady from year to year. However, you might need to bump up certain categories. For instance, if you want to go to two conferences next year instead of one, you’ll want to increase your travel expense estimate. Add new categories, if needed. You might need a completely new expense category this year. For example, if you want to start promoting pins on Pinterest, you’ll need an “advertising” category. When you are putting together your estimated expenses, it can be tempting to think that this is the time to cut back. If you see an area where you have been overspending, by all means, cut back. But, don’t opt-in to a scarcity mindset. Make sure you give your business the tools and resources that it needs to operate effectively. Also, remember that the purpose of this exercise is to come up with a revenue goal for the year. You probably (no, definitely) are going to have unexpected expenses. But it’s better to have to adjust your plan than go into the year with no plan at all. In my example, I’ve estimated my business expenses will be around $500 per month. Super mega disclaimer: I am not a CPA. I can’t tell you how much you need to be setting aside for taxes. The only thing I can tell you is that it should be more than nothing. If you are an LLC or a sole proprietorship, you will need to set aside a percentage of your business’s profits for taxes. Your tax rate will depend on a number of factors specific to you (e.g. your spouse’s income), your business entity (e.g. LLC or Corporation) and your location (e.g. state income tax). The best way to estimate your tax rate is to work with an accountant. If you don’t have one, for the purposes of this revenue goal exercise, some experts suggest using 30 percent to be safe until you can find better information. Don’t panic, now you’re going to need to do some math. To calculate your estimated taxes, divide your salary plus expenses by (1-tax rate). In my example below, $3,500/(1-.30) = $5,000. Then, subtract expenses from that number and multiply by your tax rate. ($5,000-$500)*.30 = $1,350. Here’s a better visual. When we plug our estimated taxes into the revenue goal calculation, we get this. When you add the salary, expenses, and estimated taxes together in our above example, we have a revenue goal of $58,200 for the year. Once you have your overall revenue goal, it might feel a little daunting. That’s why this next step is crucial: break down your revenue goal into smaller pieces that feel more actionable to you. For example, say you are a wedding photographer who needs to bring in $120,000 per year. If your packages start at $5,000, then you need to book 24 weddings this year, or six per quarter. Boom. Or, let’s say you are a graphic designer and you need to bring in $5,000 per month. Your hourly rate is $75, which amounts to 66 hours per month. Or, if you prefer to break it down by project, if your average project is $1,500, then you need at least three projects per month. Boom. Last one: if you are a web designer and you need to bring in $6,000 per month, and you charge $2,000 for web design, that’s three clients per month. Boom. Do you see how easy this becomes once you have a real number that you are shooting for? There’s incredible power in knowing exactly what you need. To help you work through this, I’ve put together a simple worksheet that you can use to develop your 2019 revenue goal.